Select the number of licenses you wish to purchase and click "Proceed To Checkout" below. Time-limited launch discount! Use Mind Collected on up to 3 computers and save 50%! Purchase together with Mind Collected and save 40%! All of our products are delivered instantly via internet. However, you can optionally purchase a backup CD. The backup CD includes license codes and setups for all the purchased products. The backup CD price includes worldwide shipping. Delivery time varies by destination. The mailed package also contains printed invoice for your purchase. You can always re-download the product from our website. The backup CD is entirely optional. You can also make your own backup CD. Discounts apply for total price. We would love to answer them. Please contact us. You can also read our ordering FAQ. Buy 2+ licenses of the same product and get 20%+ volume discount! 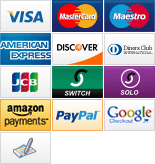 All major credit/debit cards, PayPal, Amazon Payments, Google Wallet, mail/fax orders, wire transfers. Orders are processed by BMT Micro, Inc., which is a trusted ecommerce provider that Dextronet has contract with. You can contact BMT at 1-800-414-4268 or via email at orders (at) bmtmicro (dot) com. BMT Micro has been processing online payments for over 20 years. You can contact Dextronet at support (at) dextronet (dot) com.